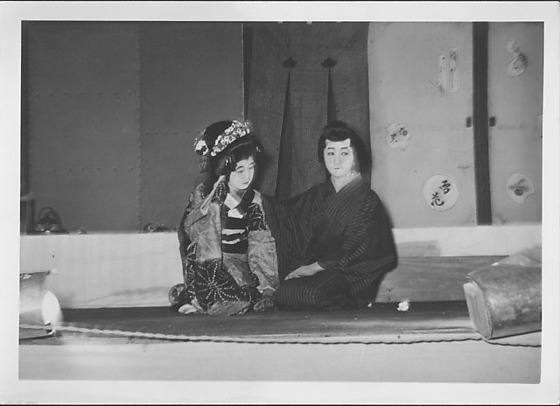 Young man and woman dressed in Japanese costume as a couple sitting on floor during a Kabuki performance at Rohwer concentration camp, Rohwer, Arkansas, October 21, 1944. The male actor sits at right in dark striped kimono with one hand on lap and the other on shoulder of female actor who wears a patterned kimono with long furisode sleeves, wig with elaborate hair ornaments and white makeup. Footlights in foreground at right and left. Noren with two vertical slits covers doorway in background. Written in pencil on back: [scratched out] Sasaki 34-7-F (2) / Tsubouchi 2 each. Stamped in black ink on back, C: OCT 21 1944.